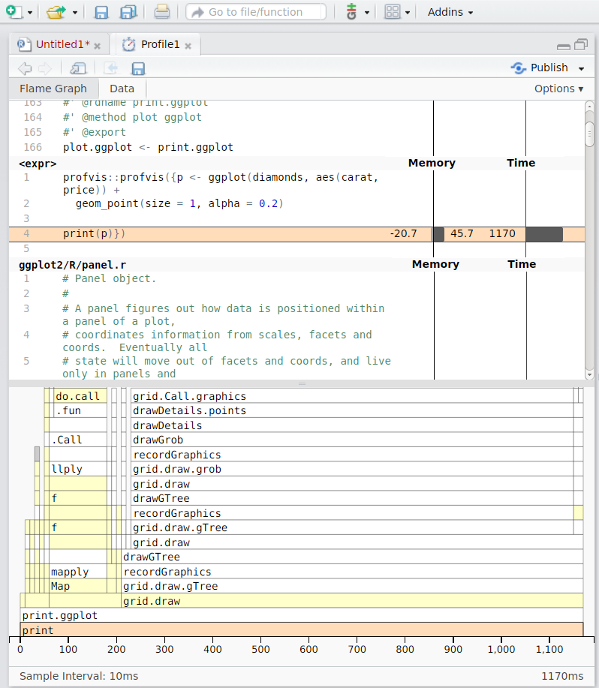 The RStudio IDE includes integrated support for profiling with profvis. These features are available in the current Preview Release of RStudio. There are a number of ways to start and stop the profiler. From the Profile menu, you can start and stop the profiler. From the Profile menu, you can run a selected block of code with profiling. Finally, it’s also possible to use profvis by calling the profvis() function, as demonstrated in the rest of the documentation on this site. 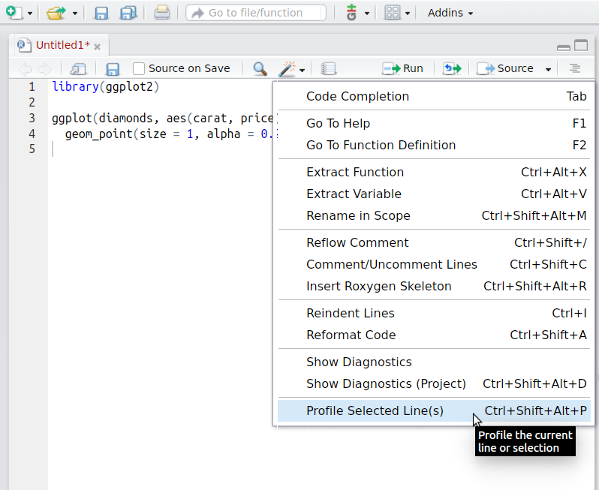 Profiles will open in a new tab in the RStudio IDE. Opening sources: If there are source refs for code that was executed, or if you ran code by using source() or the Source menu in RStudio code editor, then double-clicking on a line of code in the profile viewer will open that file in the editor. This won’t be available if the code was run from the console, and is shown as being in . If you want to be able to view code in a package, see this FAQ. Opening and saving profiles: Profiles can be saved for sharing or viewing in the future. Profile files have extension .Rprofvis. If you wish to share a profile for viewing in a web browser, you can simply rename the file to have an .html extension. Profiling Shiny applications: Entire Shiny applications can be profiled by starting the profiler before launching the application. To capture just a part of a Shiny session, you can start and stop the profiler while the application is running. Publishing profiles: Profiles can be shared on RPubs by clicking on the Publish button. See this FAQ for more information.